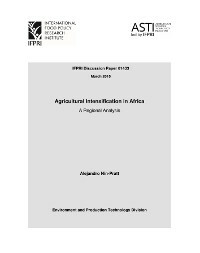 This study assesses the patterns of agricultural intensification in 40 African countries looking at the role fertilizer plays in the process. We propose a set of indicators that uses information on available agricultural land and land suitability to measure intensity of land use in agricultural production. Results show that half of the countries in our sample, those with low population density, have followed a land-abundant intensification path with growth driven by new land incorporated to crop production and increased cropping intensity through the reduction of fallow periods and increased double cropping.